Our Astrea 7mm ring is very popular. There are actually 4 crosses on this ring, only one is shown here on this photo. Very classy and stylish ring with brushed finish in the center and smooth high polish that will never dull along the sides. The crosses are lasered on for a polished finish. This ring also comes in a 4mm matching set. Q: Is there one cross or are there more? A: There are a total of three crosses that go around this band. Was this answer helpful? 29 of 35 Customer(s) found this Answer helpful. Was this answer helpful? 17 of 20 Customer(s) found this Answer helpful. 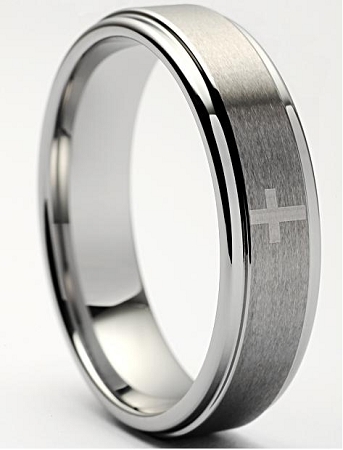 Q: Will the engraving on this ring be on the outside or inside of the band? Q: Does this ring come in 8mm size? 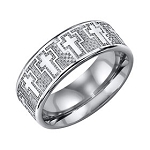 Q: how many crosses are on this ring? Thanks. The ring is a GREAT thing to have especially if you are connected to your higher power. The fit is perfect and the quality is wonderful. WELL WORTH THE PRICE!!!! great ring, great price. Looks great and feels better! Really Nice Ring. looks great and fits good. Great looking ring, great price, and super customer service. Couldn't have ask for anything more. THanks! This is the most comfortable ring I have ever worn. It is everything that it was advertised. i have already received several compliments about this ring. Highly recommended. Fits perfect now. I was planning buying another one for myself and one for my Daughter soon. I am truly impressed with the rings. I have to add that the customer service is excellent. My husband and I loved the ring. I would have liked the cross to show a little more but we still love it. We will definitely purchase another ring in the near future. I love the ring but it may be too narrow and might be too small. I'll evaluate the need. GREAT RING. Love the design and it feels GREAT!!!! This is the second ring that I have bought through Tungsten Fashions within the last two years and this one as well as the first have been lovely. The first ring I purchased was a tungten ring with a carbon fiber inlay. When this latest one showed up in the mail though, I knew it was perfect! My boyfriend likes this one more than he likes the first one, which he picked out! It fits great too! Thanks for the great product and service. Crisp, expensive cross design. Very pleased with the service! Easy ordering, emails kept me updated on shipping, and a follow up on satisfaction. The ring is exactly as described and fits great! I will order from this company again!! WOW what a value! I have had several complements and nice to know it will still look this way for a very very long time. I use this as my wedding band. Never scratches, and looks great. Very high quality. Love this ring ... I was drawn to it by the crosses on the ring ... absolutely beautiful! I cannot say enough how wonderful the customer service is. I needed an exchange and it was a great experience. I love the ring and will be buying more items from this company! Thank you for offering this service.